Well, it was so nice this morning as I was reading up on my favourite web site and having my mid-morning lattë at the Starbucks that I saw that today’s The Daily Create #tdc1976 was a lattê one. I don’t think I have done a latté one for The Daily Create before, and so it was just a synchronistic thing that I was having one when it was made. Well, because it was a special day for a The Daily Create lattç, I went back to the Barista person and told them it was okay to let me use their machine to make my own special topping, and if I do say so, it turned out quite well, and even looks like me! In case you don’t have a way with the Barista or if you don’t have the skills, then you might want to try to game The Daily Create by doing yours with an image editor. 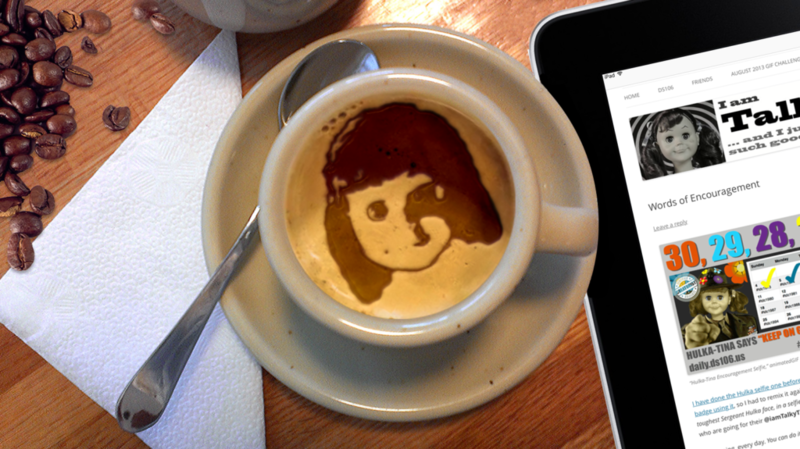 There are tons of instructions out there on the Internets about how to fake a lattè picture with your computer. This entry was posted in Animated GIF, ds106, The Daily Create and tagged accents, Blue Lightning TV Photoshop, dailycreate, How to Create Caffè Mocha, June2017 30-Day-Challenge, latté, Latte Art!, Photoshop, Starbucks, tdc1976, the Daily Create on June 7, 2017 by iamTalkyTina.